The manufacture of coins in the Roman culture, dating from about the 4th century BC, significantly influenced later development of coin minting in Europe. The origin of the word "mint" is ascribed to the manufacture of silver coin at Rome in 269 BC at the temple of Juno Moneta. This goddess became the personification of money, and her name was applied both to money and to its place of manufacture. Roman mints were spread widely across the Empire, and were sometimes used for propaganda purposes. The populace often learned of a new Roman Emperor when coins appeared with the new Emperor's portrait. Some of the emperors who ruled only for a short time made sure that a coin bore their image; Quietus, for example, ruled only part of the Roman Empire from 260 to 261 AD, and yet he issued two coins bearing his image. The Romans cast their larger copper coins in clay moulds carrying distinctive markings, not because they did not know about striking, but because it was not suitable for such large masses of metal. 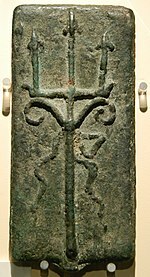 Bronze aes signatum produced by the Roman Republic after 450 BC. Roman adoption of metallic commodity money was a late development in monetary history. Bullion bars and ingots were used as money in Mesopotamia since the 7th millennium BC; and Greeks in Asia Minor had pioneered the use of coinage (which they employed in addition to other more primitive, monetary mediums of exchange) as early as the 7th century BC. Coinage proper was only introduced by the Roman Republican government c. 300 BC. The greatest city of the Magna Graecia region in southern Italy, and several other Italian cities, already had a long tradition of using coinage by this time and produced them in large quantities during the 4th century BC to pay for their wars against the inland Italian groups encroaching on their territory. For these reasons, the Romans would have certainly known about coinage systems long before their government actually introduced them. The reason behind Rome's adoption of coinage was likely cultural. The Romans had no pressing economic need, but they wanted to emulate Greek culture; they considered the institution of minted money a significant feature of that culture. However, Roman coinage initially saw very limited use. The type of money introduced by Rome was unlike that found elsewhere in the ancient Mediterranean. It combined a number of uncommon elements. One example is the large bronze bullion, the aes signatum (Latin for struck bronze). It measured about 160 by 90 millimetres (6.3 by 3.5 in) and weighed around 1,500 to 1,600 grams (53 to 56 oz), being made out of a highly leaded tin bronze. Although similar metal currency bars had been produced in Italy and northern Etruscan areas, these had been made of Aes grave, an unrefined metal with a high iron content. Along with the aes signatum, the Roman state also issued a series of bronze and silver coins that emulated the styles of those produced in Greek cities. Produced using the manner of manufacture then utilised in Greek Naples, the designs of these early coins were also heavily influenced by Greek designs. The designs on the coinage of the Republican period displayed a "solid conservatism", usually illustrating mythical scenes or personifications of various gods and goddesses. "Roman Imperial coinage" redirects here. For the catalogue, see Roman Imperial Coinage. The main focus of the imagery during the empire was on the portrait of the emperor. Coins were an important means of disseminating this image throughout the empire. Coins often attempted to make the emperor appear god-like through associating the emperor with attributes normally seen in divinities, or emphasizing the special relationship between the emperor and a particular deity by producing a preponderance of coins depicting that deity. During his campaign against Pompey, Caesar issued a variety of types that featured images of either Venus or Aeneas, attempting to associate himself with his divine ancestors. An example of an emperor who went to an extreme in proclaiming divine status was Commodus. In 192 A.D., he issued a series of coins depicting his bust clad in a lion-skin (the usual depiction of Hercules) on the obverse, and an inscription proclaiming that he was the Roman incarnation of Hercules on the reverse. Although Commodus was excessive in his depiction of his image, this extreme case is indicative of the objective of many emperors in the exploitation of their portraits. While the emperor is by far the most frequent portrait on the obverse of coins, heirs apparent, predecessors, and other family members, such as empresses, were also featured. To aid in succession, the legitimacy of an heir was affirmed by producing coins for that successor. This was done from the time of Augustus till the end of the empire. Featuring the portrait of an individual on a coin, which became legal in 44 BC, caused the coin to be viewed as embodying the attributes of the individual portrayed. Dio wrote that following the death of Caligula the Senate demonetized his coinage, and ordered that they be melted. Regardless of whether or not this actually occurred, it demonstrates the importance and meaning that was attached to the imagery on a coin. The philosopher Epictetus jokingly wrote: "Whose image does this sestertius carry? Trajan's? Give it to me. Nero's? Throw it away, it is unacceptable, it is rotten." Although the writer did not seriously expect people to get rid of their coins, this quotation demonstrates that the Romans attached a moral value to the images on their coins. Unlike the obverse, which during the imperial period almost always featured a portrait, the reverse was far more varied in its depiction. During the late Republic there were often political messages to the imagery, especially during the periods of civil war. However, by the middle of the Empire, although there were types that made important statements, and some that were overtly political or propagandistic in nature, the majority of the types were stock images of personifications or deities. While some images can be related to the policy or actions of a particular emperor, many of the choices seem arbitrary and the personifications and deities were so prosaic that their names were often omitted, as they were readily recognizable by their appearance and attributes alone. Diocletian characterizes the emperor as an interchangeable authority figure by depicting him with a generalized image. He tries to emphasize unity amongst the Romans by featuring the spirit of Romans (Sutherland 254). The reverse types of coins of the late Empire emphasized general themes, and discontinued the more specific personifications depicted previously. The reverse types featured legends that proclaimed the glory of Rome, the glory of the army, victory against the "barbarians", the restoration of happy times, and the greatness of the emperor. The theoretical standard, although not usually met in practice, remained fairly stable throughout the Republic, with the notable exception of times of war. The large number of coins required to raise an army and pay for supplies often necessitated the debasement of the coinage. An example of this is the denarii that were struck by Mark Antony to pay his army during his battles against Octavian. These coins, slightly smaller in diameter than a normal denarius, were made of noticeably debased silver. The obverse features a galley and the name Antony, while the reverse features the name of the particular legion that each issue was intended for (hoard evidence shows that these coins remained in circulation over 200 years after they were minted, due to their lower silver content). The coinage of the Julio-Claudians remained stable at 4 grams of silver, until the debasement of Nero in 64, when the silver content was reduced to 3.8 grams, perhaps due to the cost of rebuilding the city after fire consumed a considerable portion of Rome. 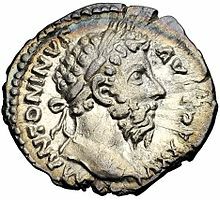 The denarius continued to decline slowly in purity, with a notable reduction instituted by Septimius Severus. This was followed by the introduction of a double denarius piece, differentiated from the denarius by the radiate crown worn by the emperor. The coin is commonly called the antoninianus by numismatists after the emperor Caracalla, who introduced the coin in early in 215. Although nominally valued at two denarii, the antoninianus never contained more than 1.6 times the amount of silver of the denarius. The profit of minting a coin valued at two denarii, but weighing only about one and a half times as much is obvious; the reaction to these coins by the public is unknown. As the number of antoniniani minted increased, the number of denarii minted decreased, until the denarius ceased to be minted in significant quantities by the middle of the third century. Again, coinage saw its greatest debasement during times of war and uncertainty. The second half of the third century was rife with this war and uncertainty, and the silver content of the antonianus fell to only 2%, losing almost any appearance of being silver. During this time the aureus remained slightly more stable, before it too became smaller and more base (lower gold content and higher base metal content) before Diocletian's reform. Each row of the following table shows the value of the boldface coin in the first column in relation to the coins in the other columns. ^ "Blanchard and Company, Inc. - The Twelve Caesars". Retrieved February 8, 2017. ^ Metcalf 2012, p. 33. ^ Burnett 1987. pp. 15–16. ^ Burnett 1987. p. 3. ^ Burnett 1987. pp. 4–5. ^ Burnett 1987. p. 16. ^ Reece 1970. p. 19. ^ Burnett 1987. p. 17. 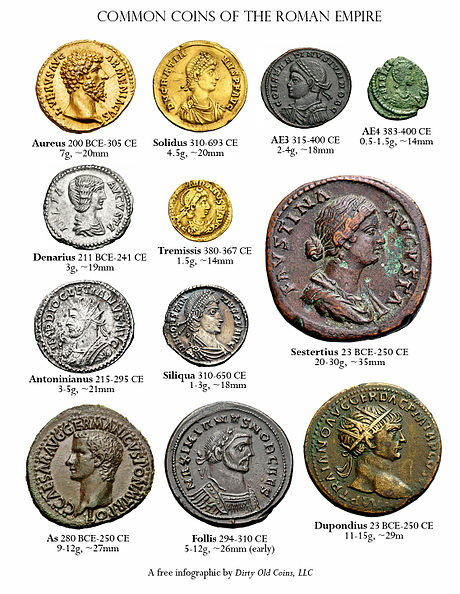 ^ "Buying Power of Ancient Coins". Archived from the original on February 10, 2013. Retrieved 2013-02-10. Burnett, Andrew (1987). Coinage in the Roman World. London: Seaby. ISBN 978-0-900652-84-4. Greene, Kevin. Archaeology of the Roman Economy. Berkeley, California: University of California Press, 1986. Melville Jones, John R., 'A Dictionary of Ancient Roman Coins', London, Spink 2003. Metcalf, William E. (2012). The Oxford Handbook of Greek and Roman Coinage. New York: Oxford University Press. ISBN 9780195305746. Reece, Richard (1970). Roman Coins. London: Ernest Benn Limited. ISBN 978-0-510-06151-7. 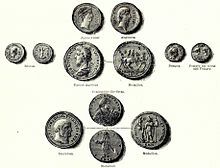 Roman coins database Large description of republican and imperial coinage with the most beautiful coins on the web. UCD Classical Museum : Roman Republican Coins. A UCD Digital Library Collection.